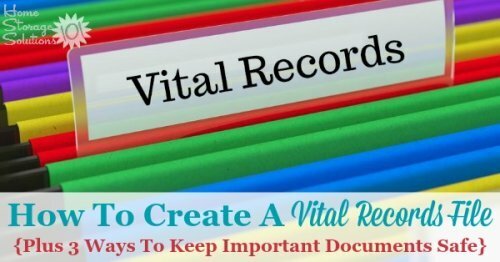 Here are instructions for how to create a vital records file, including what documents to include in it, and then a discussion of the pros and cons of three ways to keep important documents like these safe. 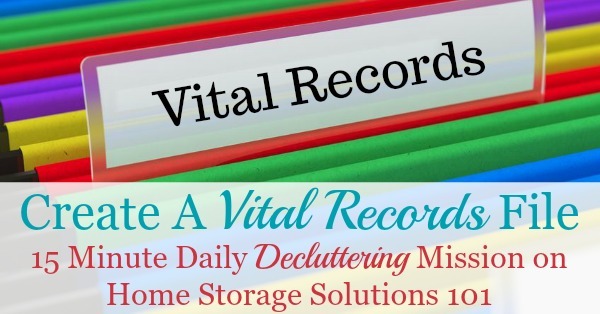 In today's Declutter 365 mission I want you to make a vital records file, as we go through the process of creating and organizing our home filing system. 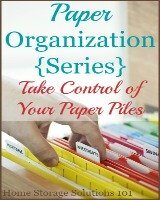 This mission is designed to be done as part of the Organize Files Challenge here on the site, but of course you can do it whenever it works best for you in organizing the papers in your home. I'll provide a full list of what I think should be in your vital records file below, but so you understand what your task is for the day, I want you to create a very special file that you'll take even more efforts to protect and safeguard than the rest of your filing system, for a few special documents that should be kept basically forever. What documents should be kept forever? I've answered this question, plus provided a free printable cheat sheet to help you know how long to keep various papers, in this article here. The first step in this mission is to gather up all of your vital records so you can put them in a file. While all of the papers that you keep in your home filing system are important (or otherwise why would you keep and file them?) these papers listed below have significant legal implications, and can be difficult or expensive to replace if lost or stolen, so that's why they're labelled as "vital." 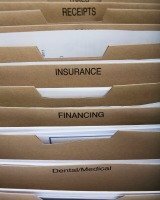 Once you've got all these documents in one location, label the file as "Important Documents" or "Vital Records" or something that immediately alerts you, and others, as to what it is, and add it to your file index. 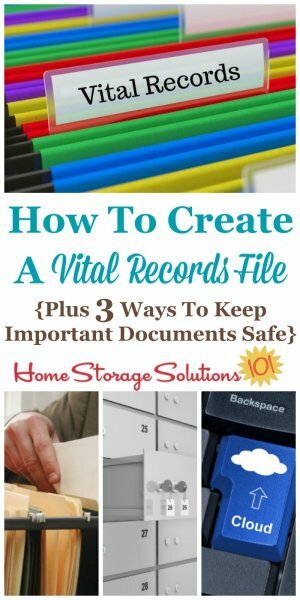 Once you've created your vital records file it's time to take steps to protect it and keep it safe, at least to the best of your ability, from theft, fire, flood and more. There are three main ways you can try to protect these records, and each of them has pros and cons. These methods are not mutually exclusive, so if you want you can also use more than one approach to help you have something like a belt and suspenders approach, so even if one method fails you've got a different back up. 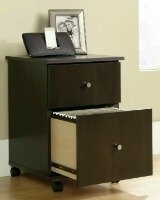 If you choose to keep your vital records and important documents within your home you should invest in a fire-resistant file box or safe, to help protect your papers in case of fire. Notice I didn't say you should get a fire-proof safe or file drawer, because nothing is completely fire-proof. When looking for something to protect your files you're looking for something with a one-hour rating, meaning that the papers will stay protected inside the container for at least an hour in temperatures two to three times hotter than most fires. That's sufficient for household purposes. Most of these file boxes are also water resistant, which can be just as important depending on where you live, to protect from flooding or the after effects of various disasters where your documents can be exposed to the elements. Most people don't need an entire large file cabinet that is fire-resistant, but instead just one smaller safe or file box will do (and be much less expensive than an entire cabinet), because although these vital records are important, they don't take up very much space. Here are some available file boxes that can do the job for you. You still run some risk when you keep your documents at your own home, because you cannot protect them from everything completely. That's why also having electronic copies (discussed below) can be a helpful back up for you if you choose this option. Some people don't want to keep the most important papers within their own home, but instead prefer to place them in a safe deposit box, often located in their bank. You've got to rent one of these boxes, so there is a cost involved that varies depending on the bank and also how large the box is (if you're only storing a few important papers and small items normally the smallest box will be sufficient). When you have your documents stored at a safe deposit box there is still risks of fires and other disasters, but you know the bank has invested in safes and boxes that are much more secure and able to withstand these disasters than the types of items you can purchase for your own home. If you choose to keep documents in a safe deposit box you should first make copies of the documents and place the copies in your normal filing system in your home, labeled as "important documents (copies)" or something similar, in case you ever need to reference them quickly (or keep digital copies, as discussed below). It can be a bit of a hassle to have to go down to the bank, during bank hours, to open your safe deposit box. Depending on the type of box you may also have to keep track of a key. There's also information specifically about wills that you should know, as it relates to their storage in a safe deposit box. Once you pass away laws in many jurisdictions automatically cause the bank to be unable to allow others to access the safe deposit box without a court order. The idea is to prevent fraud or theft while some loved ones are grieving over a family member. The other result of these types of laws though, is that it becomes difficult to access wills that are stored in safe deposit boxes at the exact time that they are most needed -- after death. Therefore, you should check with your estate attorney to learn the best place to store wills and last testaments in your state. Also make sure others know where you've placed the will once you've filed or stored it so that there is no confusion about its whereabouts later. The final method of storage for your vital records is through digital storage, such as in the cloud. While digital storage is a great thing for many types of files, so you can eliminate a lot of paper clutter, it is not a perfect storage solution for vital documents, although it is a great second back up to keep these documents safe. First, there are some important documents where it is important to have the original, and a digital copy will not be accepted (a will, for example in many jurisdictions) so only having a digital copy will not suffice. You can often get replacements of vital records, although it can cost you a fee and take some time, but you don't want to purposefully destroy a document and only keep the digital copy if you know you'll cause yourself a huge hassle if you ever need to submit it for some reason in original form. Second, you need to worry about security issues with digital storage. Just like you don't want someone to break into your home and steal your important documents, you also don't want them to steal them digitally. Make sure whatever method you use for storage of your digital documents is secure. These are the types of documents that can be the most attractive to those wanting to steal identities, so you need to take special care with them. You can use something like Dropbox for cloud storage, and you may decide that is secure enough for these sensitive documents, or you may not. I do know that my bank recently offered me its own digital storage of vital records that I could use as a backup, and that may be more secure for these types of items than other commercial cloud storage solutions. You'll have to be the judge for yourself. So as I said at the beggining of the discussion of digital storage of these documents, I don't think it should be the only solution you choose, but it can be an extra protection and safeguard for you in case one of the other two storage methods fails. I hope seeing these instructions have inspired you to create your own file for your most important documents, and then take the steps necessary to safe guard and protect them. When you begin to organize and declutter the feeling you get is contagious, so if you're loving the results you're getting I would encourage you to keep going. Just pick and choose the ones you want to do that will make a big impact in your home. But if you want someone else to tell you the order you can also grab the 15 minute daily decluttering mission calendars and follow along as we all get our homes clutter free together! 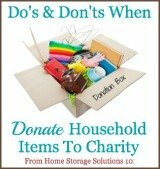 Here are additional resources and articles on the site about creating and maintaining your home filing system.